In the biggest, fastest spaceship ever designed by Swift Enterprises, Tom Jr. plans to make a grand tour of the planets in the solar system. But a group of criminal scientist's bent on conquering the universe is out to steal Tom's magnificent Cosmotron Express and destroy the young scientist and Swift Enterprises. Determined to foil the fiendish plot, Tom and his pal Bud Barclay locate the enemy's fortress laboratory but are captured. The boys make a daring escape, only to be faced with an even more grim challenge in their next encounter with the enemy. Pursued on their phenomenal interplanetary journey, they become the targets of VIPER's frightening weapon, the enormous Orb. How Tom, using his revolutionary device the Spider Crab, thwarts the feared, vicious leader of VIPER and his evil followers climaxes this gripping story of scientific combat. The main invention in this book is, of course, the Cosmotron Express. 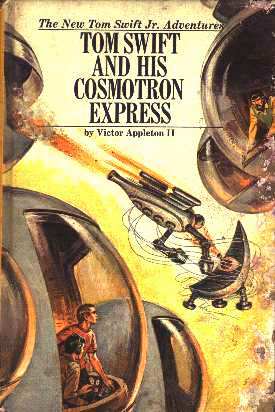 The Cosmotron Express is the largest and fastest ship that Tom Swift ever designed. "Öthe moon trip will take only three hours, and the whole grand tour of the planets shouldn't take more than two and a half to three daysÖ"
"We just don't blast up to a top speed like a rocket and then coast. Our repelatron drive accelerates the ship all the time, so our speed keeps going up. And even though we can accelerate at many times the earth's gravity pull, we don't feel it. Even the solar system looks small when you can do that!" What is the floor plan of the ship? From what I could gather, the ship is made up of four modules -- a large one in the middle, one on each side, and one on the top. The large module in the middle is the Central Control module. The others are Lab, Hangar and Storage modules. Each module, like the capsules on the Dyna-4 Capsule, are complete ships in themselves, completely detachable, and attached to the main module by passageways. Tom saw to it that the Express was well shielded from deadly cosmic rays. Not only does the Express have a duel-shell system (an inner shell and an outer shell), but Tom also built the ship from Atomeron (the metal that Tom calls the 'toughest alloy in the world') and coated it with Inertite (which completely blocks 'the strongest atomic rays'). For more information on Atomeron and Inertite, see Tom Swift and his Ultrasonic Cycloplane and Tom Swift in the Caves of Nuclear Fire. All of the modules, by the way, are coated with Non-Contam. Its purpose is to prevent the Express from "contaminating the atmosphere or surface of any of the planets by rendering our exhaust fumes harmless". How the Cosmotron Express works: The Cosmotron Express uses huge, powerful repelatrons (which will be discussed as soon as I write up a commentary on Tom Swift and his Deep-Sea Hydrodome) to move about the solar system. These repelatrons are powered by two systems: a Super-Converter that converts solar energy to electricity, and a Superatomic Cell. The only information that I could find on the Superatomic Cell is contained in these three words from Bud: "Atomic power plus". Assumedly, then, it works on a more powerful type of atomic power -- fusion, perhaps, or something along those lines. According to Tom, the main drive here is the Super-Converter. The Atomic Cell is used only in the outer reaches of the solar system where the Express can't get enough solar energy to run. How feasible is it to build a Cosmotron Express? Well, until the repelatron, Inertite, and Atomeron are developed one can hardly build the ship the way Tom built it. However, that doesn't mean that it's impossible to build a spacecraft that can really scoot around the solar system with ease. I firmly believe that it can be done, but there is one big problem standing in the way: thrust. To move about the solar system requires enormous amounts of thrust. Please realize that enormous amounts of electricity are of no use to anyone. A rocket ship depends completely on the principle of "for every action there is an equal and opposite reaction". Electricity, as powerful as it is, cannot produce a reaction and thus cannot propel a ship through space. Nuclear power, solar power, coal power -- it really makes no difference what you use, as all of them produce electricity, not thrust. Until you can find a way to translate pure electricity into thrust you are going to be unable to build any kind of truly space-fearing vehicle. That, really, is the genius behind the repelatron. Tom Swift managed to convert electricity -- in this case, either solar energy or nuclear energy -- directly into a force that can be used to move objects. Until we can learn to do the same, space travel is likely to remain an expensive and slow enterprise. How much impact would a Cosmotron Express have on civilization? Do I even need to answer this one? The Cosmotron Express would undoubtedly have an enormous impact on the exploration of space. One would no longer have to worry about long and tedious trips across the galaxy as one could simply hop in and arrive at his destination in a matter of days. "Space Cities" and "Space Arks" would not be needed when one has a nearly infinite amount of thrust at his back. The colonization of Mars and the outer planets would be expedited tremendously, as the Express -- unlike the Enterprise in Star Trek -- could actually land on the planet and thus deliver cargo firsthand. One could take trips from here to Pluto without a moment's thought about all the expensive fuel one was using -- after all, who worries about the consumption of sunlight? Minor Inventions: The X-Raser (a laser used for specimen retrieval; it's somewhat similar to the Telesampler) and the Atomic Crab (a machine that can retrieve astronauts that have floated away).